Susan telling Evan she wants exact details on the bullying cases he has identified. Harold telling Lou he has to return home but Lou wanting to stay. Harold is telling Lou that it isn't too late – he could put in an appeal and win that but Lou isn't convinced. He then asks Harold what is best about Lolly being taken away from him…for either of them and Harold can't reply. Lyn lays down the law to Flick about her conduct in the salon. They talk a bit about Lou and Lolly when Steph walks in. Neither of them are impressed as to what she has done to sell herself for the job interview she has lined up. Much to Steph's reluctance they tell her that she is going to have her hair and make-up done for the interview. Flick sits her in a chair and Steph isn't thrilled to find Flick checking her hair for creepy-crawlies! 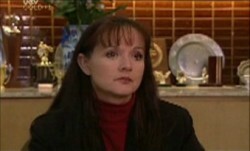 Susan calls by to asks Evan if she can sit in on the student interviews he is holding. Evan agrees to her request as long as the kids are free to talk. Susan then goes and Maggie asks if she's just seen a thaw in his relationship with Susan! Leo sneaks in and Evan mentions that he wants to see Leo at the interviews but he wonders why, especially as school is over. 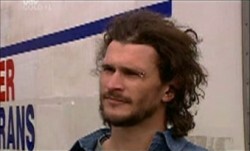 Evan tries to sell the meeting to him including the fact that he many not have to leave Erinsborough High. Leo reluctantly agrees to go to the meeting. Joe carries a sleeping Lolly in as Harold helps brings the cases in. Joe tells Lou to take care of himself before leaving. 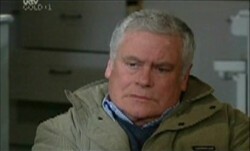 Harold tells Lou he needs to snap out of it as there are things to be done before Lolly leaves even if he may not want to do. Lou is just about in tears as Harold tells him that he has to accept it. Lyn and Flick are pleased with the job they have done on Steph but Steph isn't when she finally gets to see herself in a mirror. 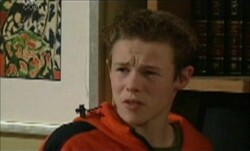 Joe comes in and starts to talk to Lyn about Lolly and Lou and the trip he is going on to deliver goods. He suddenly sees the ‘new Steph' and goes over to her, crouches down to look straight at her. Steph shakes her head as if to say it isn't her and Lyn chastises him for what he's just done. Steph sits patiently at the bar waiting and notices a guy looking at her. Eventually the guy she wants to see (Pat Connelly) arrives and is a bit surprised at what he sees. Lolly wakes up from her sleep and Harold makes himself conveniently scarce. Lou then breaks the news as best he can to Lolly that she is going to be living with the Allan's but he'll still visit her and talk to her on the phone. LOU: Don't you think that is a good idea? Flick is chatting to a mate on the phone about Paul's party whilst trying at the same time to sweep the floor of the salon with one hand. Eventually Lyn decides enough is enough and hangs up on her behalf and gives Flick her wages ($20) and sends her home to think carefully if hairdressing is the job for her. Steph is trying to sell herself in the interview but Pat seems to hint that Steph isn't up for the job because she is female and may have trouble handling the blokes. Steph tells Pat that her attire isn't how she normally dresses but Pat has heard more then enough and says sorry to Steph before he leaves. As she goes to sit down a few blokes get a bit rowdy and one of them bashes into her. She asks “do you mind” and the guy who was looking at Steph while she was waiting for Pat asks the guys to settle down on the pretence that he's having lunch with his mum. Steph is sort of embarrassed at a guy interfering and as a ‘get out clause' thanks him and asks to pass on her congratulations to his mum. She is then stunned when the guy thanks her personally using her name. Joe and Steph wait at the garage as Steph tries to remove the war paint from her face. They start to discuss the best route when the truck Joe is about to drive pulls up and the driver is the same guy Steph saw in the pub not so long ago. We find out the guy is actually called Mitch and as Joe goes off to check the truck and the goods he is carrying out, Mitch talks to Steph. She starts by asking how he knew her name and he replies that if she buys him a beer he'll tell her. Steph seems a bit taken by this guy. Maggie worms the truth out of Leo – he wasn't being bullied and the ‘bullying' he got was due to his stuff-up with the essay scam and was all his own fault. Maggie wants to know why he didn't tell Evan given that he is about to put his case forward to the school board saying that there is bullying going on at the school and what he intends to do. Steph and Mitch share a beer and he tells her how he knew her name – he spotted her one day when she was visiting Woody in Warrinor. Steph seems a bit stunned to find out he was in prison and knew Woody. Mitch then puts his foot in it by asking how Woody is and that he'd like to catch up with him. Evan is just about to launch into his spiel about bullying when Leo interrupts the meeting wanting to talk to him. Evan tries to get rid of him but Leo is insistent and Evan heads out of the room to talk to his son. Mitch apologises for putting his foot in it a few minutes ago. They chat about Woody and Steph seems comforted by the stories Mitch is telling about Woody especially the bit where Woody described Steph as being someone special. Reluctantly Mitch calls time on their chat and Steph says she'd like to hear more from him before he leaves. With the Allan's watching on, Lou is trying to reassure Lolly of the good things when she goes off with the Allans. LOU: Is there anything else you'd like to take with you? LOLLY: (giving Lou a hug) Can I take you? LOU: (tearfully hugging Lolly back) I wish you could. Sandy parts them and takes Lolly outside to the car and John semi-apologises for what has happened as he gathers Lolly's belongings and follows Sandy out. Harold appears from the kitchen to ask if he wants to accompany him outside and Lou shakes his head. Evan isn't thrilled to be finding out the truth from Leo this late in the day and again tries to suggest Leo was being bullied. Leo repeats what he told Maggie – the boys were only hassling him because he stuffed up over the essay scam. Evan wants to know why he hasn't any friends and Leo replies that he does, but not at school due to him being a teacher's son. The penny has well and truly sunk and Evan wonders what he is going to tell the meeting now. Well we don't get to hear what Evan said but given Karl has just cracked open a bottle of wine I'd say that Susan has been vindicated – there is no bullying at Erinsborough High. Susan then drops a bombshell on Karl by telling him that she may not apply for her tenure to be renewed and that it is perhaps time for a change. 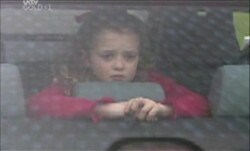 With the sad music playing, Lolly gets into the Allan's car and Lou tells her to be a good girl before giving her a fan card picture of him for her bedside table. He kisses Lolly and hugs her before closing the door. They share a final hug and kiss with Lou telling her that he loves her as the car starts. As the car makes its way out of the street, they both fondly look at each other and as soon as the car turns the corner Lou breaks down crying.